When we first met Ashley and Jared, we laughed the entire meeting. Their clever sarcasm and witty bander is unmatched. During their sunrise engagement session, we laughed even more. Ashley and Jared are so easy to talk to and fun to spend time around, so they made us forget about the early morning wakeup call pretty quickly! Not to mention, that light was totally worth the extra couple cups of coffee the day required! And also Ashley’s blue tulle skirt (we wish our blog allowed us to use heart-eye emojis, because about six of them belong right here!!)! This sweet couple is head-over-heels in love with each other. They are so sweet and playful with each other that we’re not sure we’d even consider this session “work” for us at all. They just did their thing in front of our cameras, and it turned out beautifully! 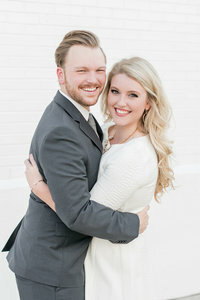 We can’t wait for wedding day portraits! Ashley and Jared are getting married at Riverchase Country Club with planning by Anita Kanellis of AK Brides, and we know it is going to be an incredible day! We are looking so forward to spending more time with these two!